Looking forward to making one of the biggest, most exciting purchases of your life? Of course you are! Stressing about finding the perfect home at the perfect price at the perfect time for the biggest purchase of your life? A life event as monumental as buying a home will always come with a side of stress. Luckily, there are plenty of things you can do to make that stress a lot less. No matter what field you're dipping your toe into, professional lingo can be daunting and off-putting. When you don't feel you understand anything that's being said, it's easy for your stress levels to rise and rise and rise. Learn common real estate terms so you have a base knowledge of what is being said and what it means for you. Some terms like "principal" and "appraisal" might be easier to wrap your head around than others. Don't hesitate to sit down with a pro and ask them to help you understand the more complicated, math-intensive terms like annual percentage rate (APR) or the difference between adjustable-rate and fixed-rate mortgages—and which is right for you. Looking through online listings helps you get a better feel for what you want and what's available. You can learn what kinds of homes are available in an area and what price ranges to expect for the size house you're looking for. Distance to work, school, shopping, etc. Then, once you're ready to start searching in earnest, you'll have a better idea of what you're looking for. A financial investment this big means the earlier you start getting your financial ducks in a row, the better. Obtain a free credit report so you can start getting an idea of your score and pinpoint trouble spots that need correcting. If you're not in serious search mode yet, get a pre-qualification. This isn't a guarantee of a loan, but it will give you a good idea of the size loan you can—you guessed it—qualify for. If you're in serious search mode, skip right to pre-approval, which provides a stronger start to the loan process. Oh, and don't forget to keep saving up for that down payment (20% is ideal, but you need at least 5% to qualify for a conventional loan). Sure, it's a lot to put down, but a more sizeable down payment only do you favors in the long run. You may want to buy a home rightthissecond, but it might not be the right time. If you know you have a major life change in the near future, it might not be a great time in your life to buy a home. Is your company planning to relocate you in the next couple years? Put off buying a home. Considering changing jobs? Put off buying a home. Remember that lenders don't like to see big changes—like changing jobs, buying large items on credit, becoming self employed—right before applying for a loan. In fact, you'll be in the best shape if you can put off those life changes until well after closing. Start looking into homeowner's insurance. It's easy to worry about something bad happening to a big investment. Knowing the coverage you can get with insurance can help calm your nerves. You can also start looking at home warranties. Simple one-year warranties are popular, but it never hurts to look and see if you can get warrantee coverage for longer periods of time. Insurance and warranties might help calm your mind about unexpected expenses that can crop up as homeowners that you never had to worry about as renters. 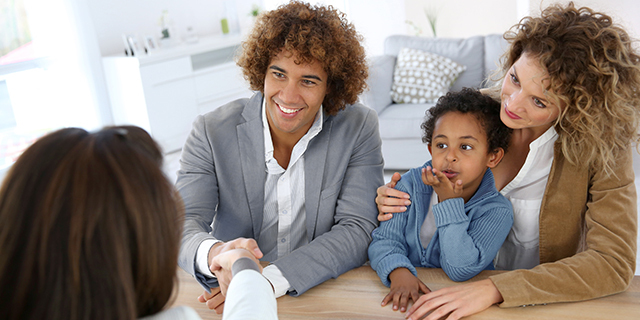 A good realtor can help guide newbies through the home-buying process, making sure you understand exactly what is going on and what is expected of you. A good realtor can help impartially point out the pros and cons of homes, making sure you have noticed any red flags and generally making home buying a positive, successful experience for you. Same goes for a lender. Sure, you want to shop around for the best mortgage, but finding a lender that is patient and willing to answer questions and provide further explanations of what can be daunting financial jargon—as you're making major decisions—will elevate your experience and reduce your stress. Although home buying will never be completely stress free, large amounts of stress and doubt may be a sign that it's time to slow down. Home buying isn't a decision you want to rush, so when in doubt: wait.